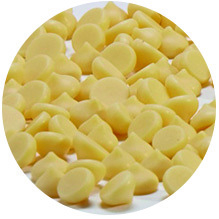 Cacao butter drops are our premium edible natural cacao butter, produced from Peruvian cacao beans for creating fine chocolate. This butter has a wonderful chocolate aroma & taste. This product is excellent for making chocolate, white chocolate and for any recipes where the powerful aroma of chocolate is required. Natural cacao butter is obtained from whole cacao beans which are fermented and roasted for flavour and then pressed to separate the butter from the cocoa solids. Cacao butter contains a large proportion of minerals including calcium, potassium, magnesium, zinc, manganese, copper and iron. Excellent for making chocolate (especially white chocolate) recipes and desserts.